This crazy city of Phoenix was predicting temperatures in the range of 118 to 121 degrees over the next few days. Since 121 degrees is one of the true definitions of hell, I thought it would be a good idea to provide emergency heat relief to folks living on the street who might not be able to find shelter. So I organized a training on heat emergencies for good Samaritans. The training went well and when we were done we loaded up a couple of vehicles with volunteers, who set out into the sprawl of downtown Phoenix to comb the streets for people in distress. My buddy, Sean and I loaded up my pickup with ice, water, towels, and other necessary supplies and headed out. Since the local Fox station was doing a short segment on our heat relief efforts, they followed us in their car, in case we found someone to help so they could film it. Very shortly, we spotted a little older lady slumped in a wheelchair outside a downtown Circle K.
We parked and walked up to the lady to bring her water. She was not in any apparent distress but she was hot and she felt that she could only go in the Circle K to cool down if she bought something… and then she told us someone stole all her money. We gave her water and Gatorade and then tried to figure out what to do. We didn’t want to leave her there; the forecast high was for 119 and I honestly didn’t believe she would last long in the heat. We saw no heat relief stations anywhere nearby on our map. I couldn’t transport her in my truck because we didn’t have room and it was agreed at our organization that we should not be transporting people for liability reasons. I called the non-emergency number for Phoenix Police. They told me to call a crisis line and someone would arrange to transport her and her wheelchair to a shelter. I called the crisis line. 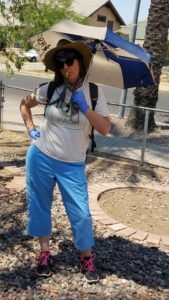 They informed me that the Arizona Department of Health Services (DHS) was a heat relief station and since it was about a block away, perhaps we should push her over there to cool off? Sean pushed the lady in her chair down the street over to DHS. You are now, I thought. I got a call back from crisis and was told I needed to call another number to arrange transport. I called the other number and was told I wasn’t calling the right number. I noticed the guy at the front desk at DHS trying to discreetly call someone higher up the food chain to find out if they really were a heat relief station. I called crisis back and was told to call a transport company. I called crisis again and a different person told me they would try to arrange the response team, but it might take one or two hours. I said to myself, wtf. Our lady, by this time was getting antsy. She was hungry. 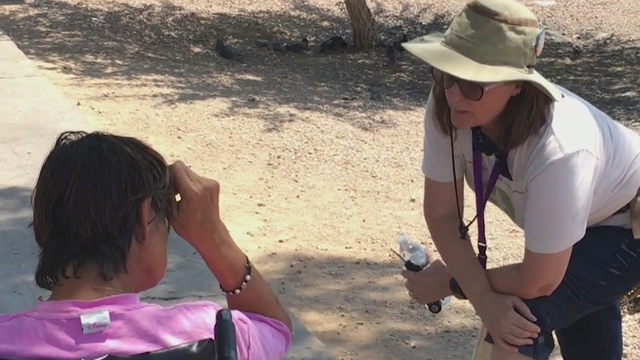 She told us she’d “rather die” than go to the Central Arizona Shelter Services (CASS) or the overflow shelter. The people there were mean to her and pushed her out of her wheelchair. She wanted to leave DHS and go. Where, was not exactly clear. We knew that if she left, we’d find her over by the Circle K again, and possibly heat stroked or dead. I got another call from crisis. They said they would start mobilizing transport, but it would only take our lady to CASS. Our lady refused to go to CASS. I asked crisis if they could perhaps, just take her a little ways east of CASS to Andre House, where she would be treated well and fed. No, they couldn’t do that. They could only take her to CASS. By then, the people in the lobby at DHS were joined by some higher-up-type people. One lady who appeared to be In Charge, was also making phone calls. I found out she was also calling crisis, as she had been instructed by Phoenix PD. Her crisis dispatcher said they would send Phoenix Fire Dept paramedics to look the lady over and then the crisis van would be right behind them. By this time, over an hour had passed. Phoenix Fire arrived with the usual consort of burly EMTs and paramedics. They asked our lady her name, she gave it to them. They asked if they could check her out to see if she had any medical problems. We waited for the crisis van that was “right behind them”. Our lady needed to go to the bathroom, so I took her. When she rolled out of the stall she informed me that she had peed blood. I got another phone call from crisis. This different woman told me that she really didn’t understand why we’d been calling them, because they absolutely don’t transport people in wheelchairs. I could feel my blood pressure start to inch up. She seemed shocked that anyone would call a crisis hotline to move homeless people around. I told her that this WAS a crisis. She told me to call our state medicaid “Mercy Care” help line and gave me the number. By this time two hours had passed and our lady really, really wanted to leave. She had no place to go and there was no way she would get far under her own steam, but she wanted to go. I called the Mercy Care help line and spoke to someone who told me a cab could be called to pick her up. A cab. Think of it! We waited some more. It was almost time for DHS to close for the day. Your cab will be there soon! Oops, sorry, your cab had problems, but no worries, we’re sending a new cab! By now our lady was headed for the doors. The goofy DHS people tried barring to doors to keep her from leaving. She started yelling and banging on the doors. We told the weird DHS people to stop that, if the lady wanted to leave, she damned well could leave. “But she will get away!” one said. The cab arrived just as our lady made her break for freedom. We bundled her into the cab and shoved her wheelchair in the trunk. I gave the driver the address for Andre House, urged our lady to seek medical treatment, and we waved as the cab pulled away. By then it was time for dinner, so we all went out for Thai. We found out from our other volunteers that they helped 35 to 40 people that day. But we did just fine. 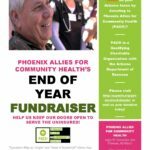 ← Donate to PACH and Receive an Arizona Charitable Tax Credit!